Diversified Plastics, Inc. (DPI) has acquired the assets of Pacific Plastics Injection Molding (PPIM) in Vista, Calif. PPIM offers custom plastic-injection molding as well as design and custom mold making services to industrial, electronics, telecommunications, medical and filtration markets. “The acquisition of PPIM provides synergy with DPI’s services and customers as well as geographic benefits and diversification into new industry segments,” says Kevin Hogan, chief executive officer for Diversified Plastics, Inc.
PPIM provides a single source for injection-molded plastic parts, product design and design support, in-house and offshore tooling, and value-added assembly and packaging services. ISO 9001:2015 registered, the company has 30 employees and an 18,000-square foot facility in Southern California. PPIM is Diversified Plastic, Inc.’s first acquisition. The PPIM purchase is part of DPI’s strategic growth initiative. 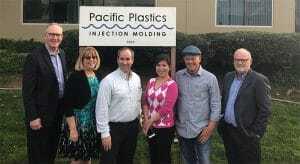 Visit www.pacificplastic.com for details on Pacific Plastics Injection Molding’s services and capabilities or call +1 760.598.5333. For more information about Diversified Plastics, Inc., visit www.divplast.com, call +1 763.424.2525 or email dpisales@divplast.com.